The 15th edition of the Malta Military Tattoo is being held at St. George’s Square, Valletta between the 21st and the 23rd September, as part of the Valletta 2018 Cultural Programme. Valletta is this year hosting the prestigious European Capital of Culture title, and making the move to Valletta in the superb environment of St. George’s Square was a must. The Malta Military Tattoo has steadily grown into the event which provides a platform to local Military Bands to come together and display their talents in an appealing and entertaining performance for all to enjoy. Together with the local element, the guests of the Tattoo offer an enriched contribution to the display and bring military music traditions from overseas. International groups participating this year include: Topside, the U.S. Naval Forces Europe’s New Orleans-style brass band; and the Bersaglieri di Trapani from Trapani, Sicily. The latter was established in 2002 in Sicily to maintain the traditions of the region. The members are all dedicated to preserve the deep and patriotic values of their ancestors. The band has been invited to various events across Europe, bringing to audiences a modern youthful version of the Bersaglieri whilst also maintaining the traditional values of the Bersaglieri Corps. Joining these international military bands is The Emerald Isle Dance Team; a formation of dancers from Dublin and Kildare in Ireland, led by members of the renowned Cairde Damhsa Irish Dance Teachers Association. They dance to the traditional Irish music and bring to the Tattoo the traditions of dance routines associated with military displays. They have performed at a vast array of Tattoo displays including the Edinburgh Military Tattoo. Several local military groups will also have their own display. The Band of the Armed Forces of Malta which annually provides a display prepared entirely for the Malta Military Tattoo, will this year provide a pleasant surprise to the audiences. They will also be joined by the drill team, who display the precision and discipline of the military routines. The Malta Police Force Band is also preparing a display to impress and will this year provide elements to make the audiences clap with enthusiasm. The Police Force Drill Team will also be present with a precision display for all to admire. The Massed Pipes and Drums will be made up of 4 local Maltese pipe bands: 1st Cospicua Scout Group Pipes and Drums; 1st Hamrun Scout Group Duke of Argyll‘s Own Pipe Band; Marsa Scouts Pipes and Drums; and the Wallace Pipes and Drums – Malta. They will be accompanied by the Maltese group of Highland Dancers from the Artistique Dance Company. The show will be held on the 21st, 22nd and 23rd of September, starting at the Grandmaster’s Palace Courtyard and proceeding towards St George’s Square. 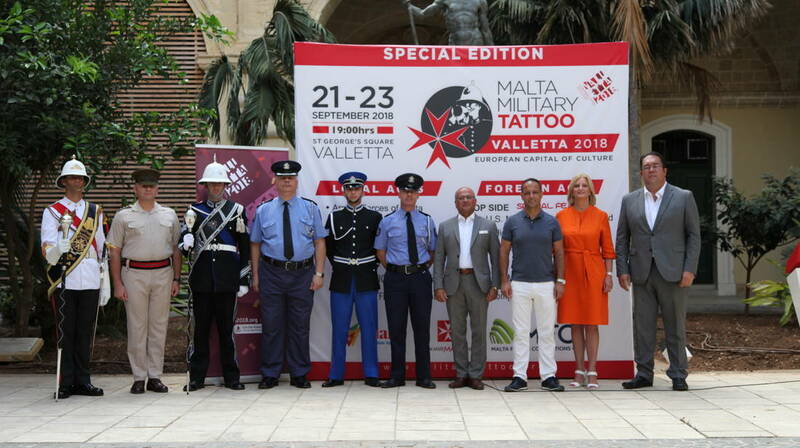 The Malta Military Tattoo is organised by MFCC, with the support and collaboration of the Valletta 2018 Foundation and the Malta Tourism Authority. Tickets are on sale online from ticketline.com.mt or from the MFCC Offices, Level One Millennium Stand, Ta’ Qali or from the Embassy Cinema Complex, Valletta. For more information visit mfcc.com.mt or maltamilitarytattoo.org, follow MFCC and the Malta Military Tattoo pages on Facebook, or call on 21410371.